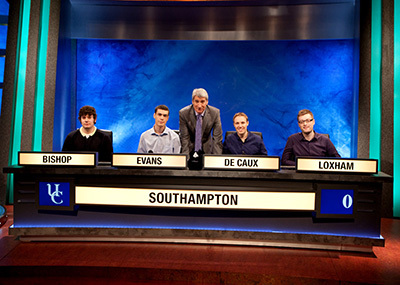 I’ve always been a huge fan of University Challenge and have shouted answers at my TV for years (a lot of them wrong, of course!) I missed out on the opportunity to go on when I was an undergraduate and assumed that the chance had gone. However, once I had been accepted on to my PhD course, it was suddenly very near the top of my to-do list. Definitely waiting behind the studio curtain before we walked on to the set. The audience isn’t huge, but it still feels intimidating and there is no turning back at that point – you know that whatever you say is going to be broadcast! What is the story behind your SUSU cat mascot? All the teams bring a lucky mascot with them, and Richard Evans on our team thought that we should bring SUSU the cat along, seeing as she is such a Southampton legend. Unfortunately, the logistics of having a live cat sitting on our desk meant that we had to go for a replica version instead! We were pleased that she got a close-up in the first round though, as well as a mention of her Facebook page! How did this time compare to your last appearance? Even backstage before the last game, we could tell that our first round opponents were a very strong team. I think that fact, combined with the nerves, meant that we were a little bit slow on the buzzer. This time we all decided to be a lot more gung-ho and it paid off. I even smile in this game, which I’m not sure I managed to do at all in the first round (although obviously it’s easier when you’re winning)! Winning the playoff on Monday means that we are through to the second round, which I think is uncharted territory for the university, certainly in recent years. If we win then we’re through to the quarter finals, but there are no second chances this time – lose and we’re definitely out.